Embarrassing is not a word Peter Hutton uses comfortably concerning his hometown club. With 500-plus games as player and manager, he has experienced both ends of the football spectrum in a candy-striped shirt, a shirt he now expects his players to wear with the sort of pride he did; win, lose or draw. Friday night’s abject 2-0 defeat to a Galway United team missing NINE first team regulars crossed a line for Hutton. 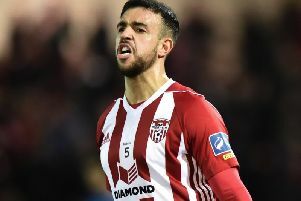 The Derry manager kept his players locked in the dressing room for 45 minutes after a display that was greeted by a chorus of boos at both half and full-time. It was inept, disjointed and lifeless. In short, it was shocking and some of the players are now playing for their futures. Goalscoring has been a problem and remains so. Nine goals in 12 league games tells its own story but against a Galway defence with midfielder Stephen Walsh at centre-back, right-back Colm Horgan shifted left and teenager Cormac Raftery on the right, Hutton had a right to expect more. He started with two up front, a formation surprisingly mirrored by the attack-minded visitors who included former Derry striker Enda Curran and who were well worth their 2-0 victory. Ironically Derry started well. The rarity of two teams employing 4-4-2 made for an open game. With only one minute on the clock, Mark Timlin’s early corner broke for Cillian Morrison who saw his goalbound shot bundled clear amid a crowd of bodies inside the Galway area. That was as good as it got from a home point of view. For all Derry’s difficulties in front of goal this season, the three-man central midfield has always given Hutton’s team a degree of control and that was missing on Friday. The players appeared to take the inclusion of an extra front man as an excuse to hit the forwards as early as possible but the long, aimless balls suited the Galway back line. And if you are going to employ the long ball, then getting support players around the second ball becomes vital and Derry never counted on that front. Too many passes were hopeful rather than incisive with the front two of Elding, who finished the game in nets, and Morrison never getting close enough to offer any real support to each other. They played like two lone front men rather than an attacking partnership. Of course there were mitigating circumstances. How many games during Hutton’s long career do you think he has seen his team lose two goalkeepers in the same 90 minutes? It was a damning indictment of Derry’s attacking display though that Elding’s biggest contribution came when he replaced the stricken Shaun Patton in nets during the second half and produced a superb save from Padraic Cunningham who had been put clean through. Following Derry’s early forays forward, the visitors settled with midfielder Ryan Connolly controlling the game. Yet there was little between the teams when Cunningham’s 18-yard strike forced Gerard Doherty to dive to his left and push it away for a corner on 22 minutes. There had been question marks over Doherty’s fitness and whether he injured himself in the save was unclear but when the subsequent corner came in from Connolly, the Derry keeper spilled it at the feet of Cunningham who snapped up the gift to fire Galway ahead. Things went from bad to worse 10 minutes later. Ryan McBride gave away a needless free for a foul on Enda Curran just inside the Derry half. There looked little danger of a direct threat given the distance from goal and Derry’s high defensive line. Again Connolly was the Galway player over the dead-ball but even he must not have believed his luck when Shaun Kelly completely switched off to allow Jake Kelly to ghost in from the left side and receive the freedom of the penalty area to head the visitors two goals in front. Three minutes later Connolly’s in-swinging corner struck the cross-bar with Derry again in disarray and a disbelieving Brandywell crowd looking on in horror. Doherty hobbled off on 34 minutes to be replaced by Shaun Patton but things did not improve. Three minutes before the break McBride’s clearance inside the 18-yard box was straight at Curran who controlled and headed for goal. McBride dived in to retrieve his error which sent the striker tumbling but it looked like the Derry captain had done just enough to touch the ball away although an irate Tommy Dunne did not appear to agree with the referee’s decision. The crowd made their feelings known at half-time and Derry did improve marginally after the break but rarely looked like forcing their way back into the game. Bereft of ideas they continued to throw the ball forward at every opportunity but it was difficult to see what the plan was. Without Patrick McEleney, the focal point had vanished and it was Galway who looked more like scoring a third than Derry getting back into the game. The pattern of ‘Derry long ball-Galway defensive clearance’ continued throughout the half although McNamee and Morrison were more prominent for the home team who were leaving gaps at the back as they searched for a goal. On 67 minutes, Patton had a rush of blood when Galway’s Gary Shanahan looked to get away. The Derry substitute keeper needlessly rushed off his line to attempt a headed clearance but the Galway player got there first and nudged ahead before receiving the full force of Patton’s challenge. It was a nasty looking head injury which required a visit to the hospital and Patton, who was forced off himself, was lucky to escape without at least a booking. The full-time whistle brought the expected response from frustrated spectators. It is not something a proud Derry City man like Peter Hutton will have enjoyed hearing and he will expect a reaction from his players. Derry City: Gerard Doherty (Shaun Patton 35mins (Ryan Curran 73mins)), Shaun Kelly, Ryan McBride, Shane McEleney, Aaron Barry; Josh Daniels (R. Curtis, 58mins), Philip Lowry, Barry McNamee, Mark Timlin; Anthony Elding, Cillian Morrison; Subs Not Used - Dean Jarvis, Seanan Clucas, Nathan Boyle, Sean Houston. Galway United: Connor Gleeson; Cormac Raftery, Stephen Walsh, Paul Sinnott, Colm Horgan; Gary Shanahan (Antoine O’Laoi 73mins), Ryan Connolly, David O’Leary, Jake Keegan; Padraic Cunningham, Enda Curran; Subs Not Used - Killian Cantwell, Aaron McDonagh, Kevin Garcia, Sam Oji, Conor Winn.